With all eyes on the federal tax debates, it’s important to not lose sight of tax policy discussions and opportunities in the states. State and local tax systems often make it more difficult for families to make their way out of poverty, but the Institute on Taxation and Economic Policy (ITEP) lays out state tax policy tools that can improve tax fairness in its 2017 report on State Tax Codes as Poverty-Fighting Tools. The report provides an overview of anti-poverty tax policies – refundable state EITCs, property tax circuit breakers, targeted low-income credits, and child-related credits – and shares recent state developments as well as concrete policy recommendations. Download the full report: State Tax Codes as Poverty Fighting Tools: 2017 Update on Four Key Policies in All 50 States. 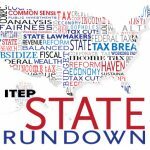 For a recent summary on state tax developments, see also ITEP’s latest State Rundown.